Collectors Contemporary is pleased to present the works of conceptual artist Tim Sullivan in his first solo show in Asia. 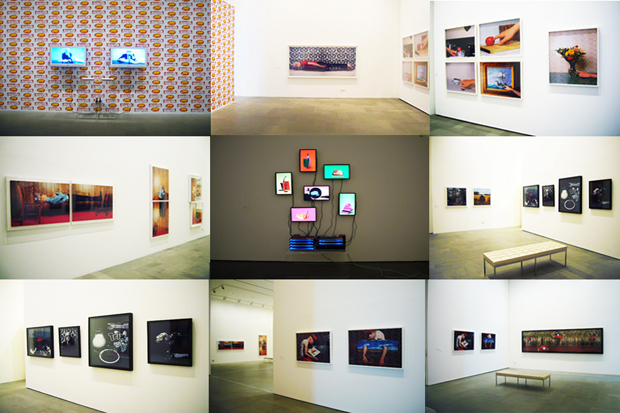 Sullivan’s photographs are a playful combination of images of popular culture and metaphysical symbols of high culture. The artist has always been concerned with the exploration of the self-critical tendency within modern art. However, the appeal of Sullivan’s art lies in his ingenious ability to translate complex, multi-layered ideas and aesthetic discourses into humorous, seemingly light-hearted visual images. As an intricate visual reference to the nature of modern art, the work of Sullivan provides an intriguing introduction to conceptual art and appropriation. The Tim Sullivan Show will present, for the first time in Asia, the full edition of his evocative photographs shown at the 2006 California Biennial organised by the Orange County Museum of Art. 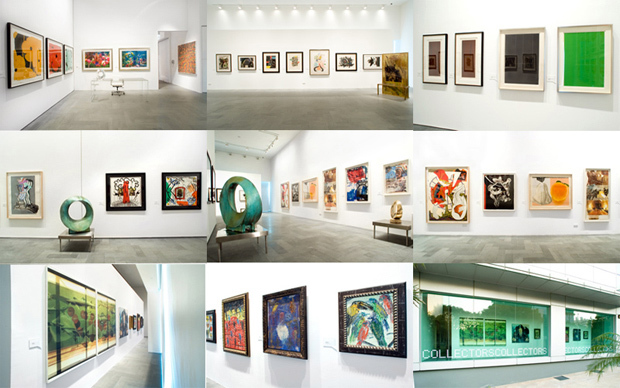 Collectors Contemporary also offers the art audience in Singapore an exciting opportunity to enjoy the artist’s most recent installation works, specially commissioned for our show. 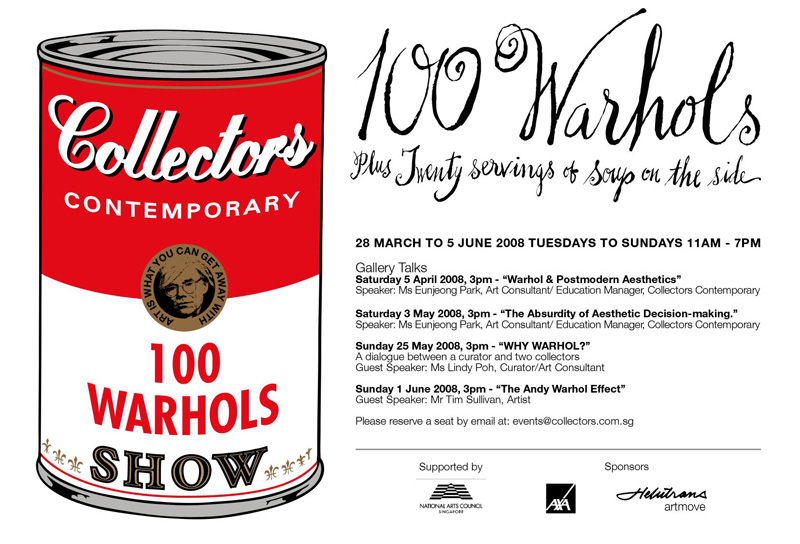 100 WARHOLS (PLUS TWENTY SERVINGS OF SOUP ON THE SIDE) showcases groundbreaking artworks created by Andy Warhol throughout his artistic career. Apart from rare trial proof prints from the Endangered Species (1983), Martha Graham (1986) and Camouflage (1987) series, the show presents the complete portfolio sets of Campbell’s Soup I (1968) & II (1969), Flash-November, 22, 1963 (1968), Electric Chairs (1971), Mao (1972), Myths (Trial Proof 1981) and Hans Christian Andersen (Trial Proof 1987). Most of the works in the show are seen for the first time in Singapore; the art audience here will have an exciting opportunity to appreciate the historical Birmingham Race Riot (1964), Kiss (1966), Lincoln Centre Ticket (1967), Daily News CA. 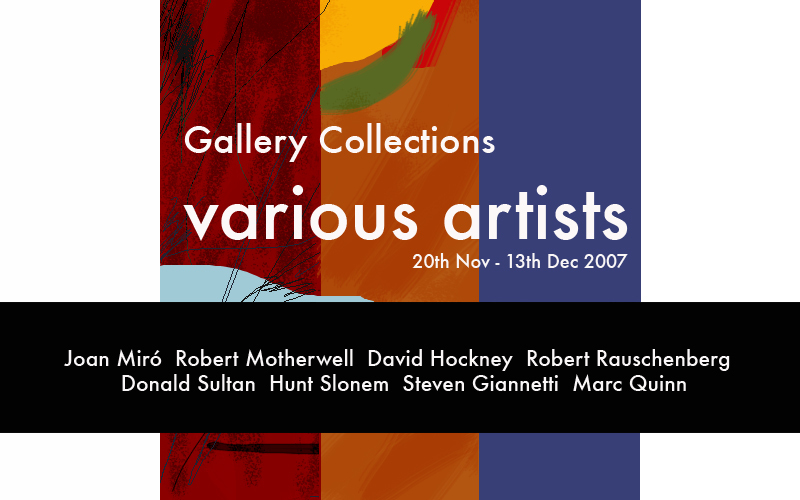 (1967), SAS Passenger Ticket (1968), KIKU (1983) and Ads (1985) as well as unique screenprints such as Gun CA. (1982), Querelle (1982) and Diana Vreeland Rampant (1984). The show also presents the memorabilia of the artist such as the Souper Dress, Dossier of the Thirteen Most Wanted Men (1964) and signed editions of Interview magazines and his book Popism: The Warhol ‘60s (Harper & Row 1983). Canvas works from the mid 1980s such as Moon Explorer Robot (1983), Campbell’s Soup Box-Chicken Noodle (1986) and the iconic Rebel without a Cause (James Dean, 1985) will be presented as well. 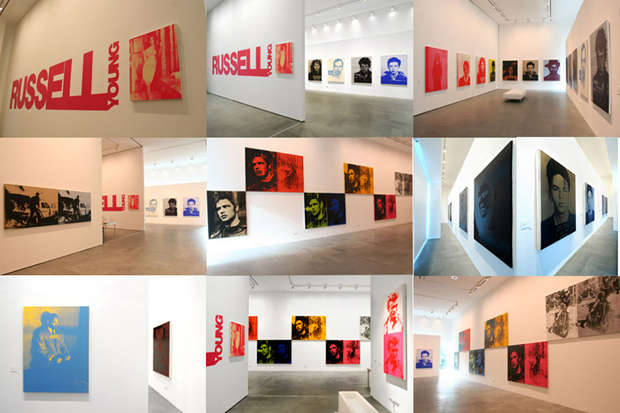 In 2003, Russell Young presented Pig Portraits, a series of silkscreen paintings of Malcolm X, Jane Fonda, Al Pacino, Frank Sinatra and Sid Vicious etc, not in their glamorous moments but in police mugshots. According to Young, his method of working is ‘to search, destroy and create’. Acquiring images of celebrities from police departments, newspaper cuttings or e-bay, he enlarges it up to 5 feet tall, then silkscreens them onto canvas, then washes out the images in faded pink, blue, yellow, black and silver. Since his sold-out show of Pig Portraits at the Don O’ Melveny Gallery, LA, Young´s works are now being collected by the most discerning collectors worldwide. 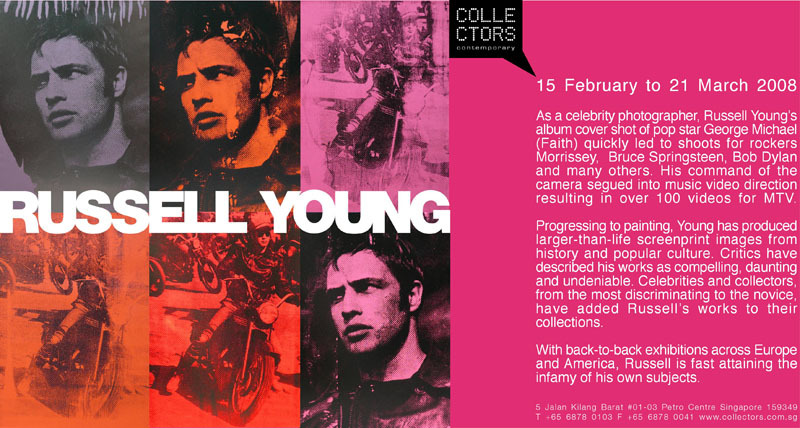 Most recently, Young created a series of haunting images of screen idols, Marlon Brando and Steve McQueen. The Asian debut of the artist includes mugshot images from his Pig Portraits series together with his latest works of Marlon Brando and Steve McQueen, without doubt the darkest and most compelling works that he has ever produced. The ubiquitous imagery of mass culture and its immediate accessibility as subject matter have often obscured the true force of Pop art. Consequently, the provocative aspect of Pop art as an aesthetic discourse has been underestimated by the overemphasis on its subject matter. 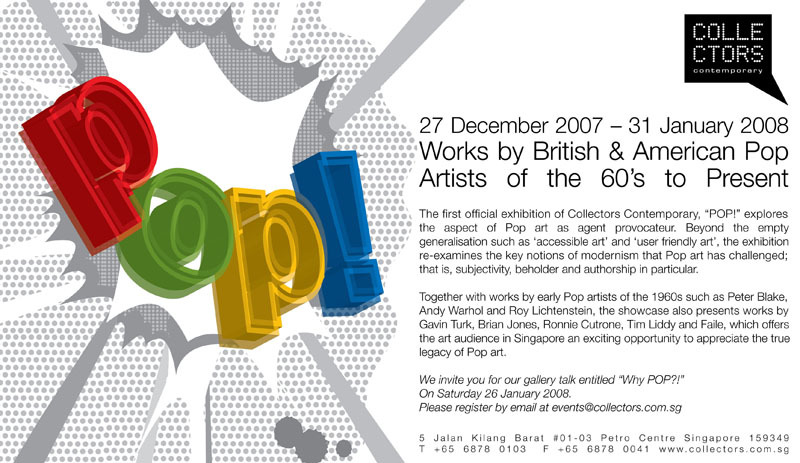 The first official exhibition of Collectors Contemporary, POP! explores this aspect of Pop art as agent provocateur. Beyond the empty generalisation such as ‘accessible art’ and ‘user friendly art’, the exhibition re-examines the key notions of modernism that Pop art has challenged; that is, subjectivity, beholder and authorship in particular. 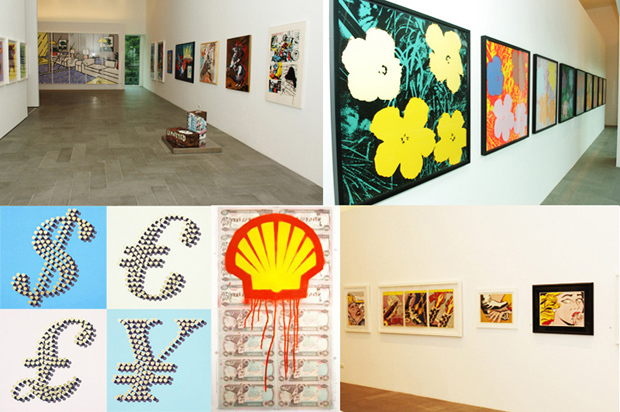 Together with works by early Pop artists of the 1960s such as Peter Blake, Andy Warhol and Roy Lichtenstein, the showcase also presents works by Gavin Turk, Brian Jones, Russell Young, Ronnie Cutrone and Faile, which offers the art audience in Singapore an exciting opportunity to appreciate the true legacy of Pop art. We will be closed for the holidays. 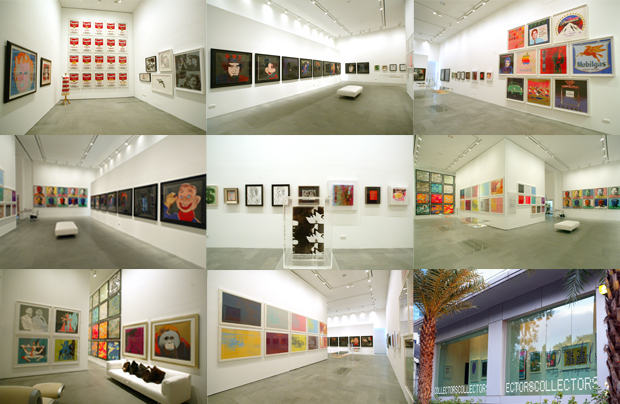 Collectors Contemporary wishes you Merry Christmas and a Happy New Year! 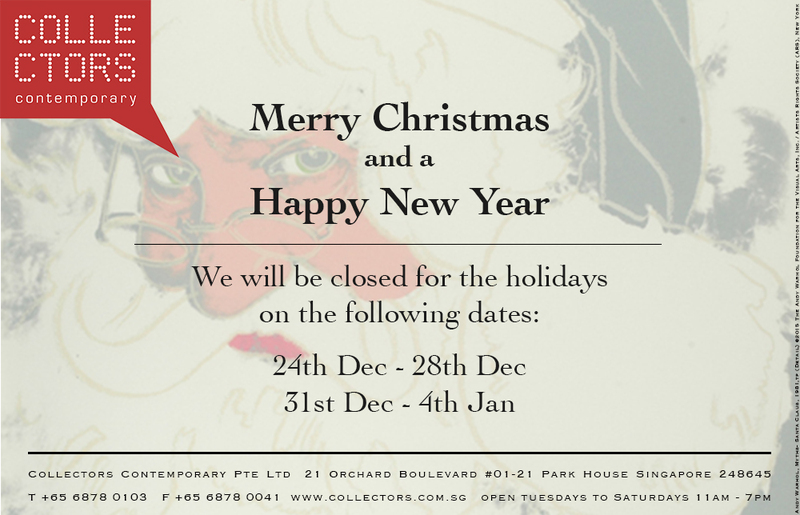 Collectors Contemporary wishes you a Merry Christmas and a Happy New Year.